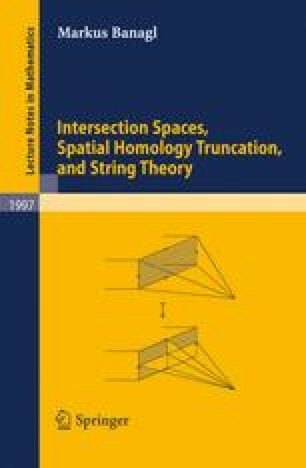 For a given pseudomanifold, the homology of its intersection space is not isomorphic to its intersection homology, but the two sets of groups are closely related. The reflective diagrams to be introduced in this section will be used to display the precise relationship between the two theories in the isolated singularities case. This reflective nature of the relationship correlates with the fact that the two theories form a mirror-pair for singular Calabi–Yau conifolds, see Section 3.8. Let R be a ring. If M is an R-module, we will write M* for the dual Hom(M,R). Let k be an integer.